JTA — Following the victory of Volodymyr Zelensky in Ukraine’s presidential elections, the country will become the only one in the world besides Israel whose president and prime minister are both Jewish. When Zelensky is sworn in as president, his prime minister — at least for a while and possibly until the parliamentary elections scheduled to take place sometime later this year — will be Volodymyr Groysman, a Jewish politician who was the mayor of the city of Vinnytsia. To some of incumbent Petro Poroshenko’s critics, the landslide success of the vague campaign by the politically inexperienced Zelensky, a comedian, was not surprising in light of widespread resentment over the persistence of corruption under Poroshenko, who was elected in 2014 on a platform that vowed remedial action on exactly that front. More unusual to some, however, was how Zelensky’s appears to have won the elections so decisively in spite of how his Jewish ancestry – his mother, Rima, is Jewish and he has jokingly referred to this during the campaign — is well known in Ukraine. After all, Russia and other critics claim Ukrainian society has a serious anti-Semitism problem and legacy. “Imagine, a pure-blooded Jew with the appearance of a Sholom Aleichem protagonist wins by a landslide in a country where the glorification of Nazi criminals is enacted into law,” wrote Avigdor Eskin, a Russian-Israeli columnist, in an analysis published earlier this month by the Regnum news agency. Eskin in column on Zelensky downplayed allegations of widespread anti-Semitism in Ukraine, attributing much of the attention to the problem in media and beyond to propaganda by Russia, which is involved in an armed conflict over territory with Ukraine. But Eskin’s statement about Ukrainian laws glorifying Nazi criminals is not inaccurate, and Russia is not alone in criticizing Ukraine over this and other issues connected to anti-Semitism. Last year, Israel’s government singled out Ukraine as a regional trouble spot in the Israeli government’s annual report on anti-Semitism. “A striking exception in the trend of decrease in anti-Semitic incidents in Eastern Europe was Ukraine, where the number of recorded anti-Semitic attacks was doubled from last year and surpassed the tally for all the incidents reported throughout the entire region combined,” the report said. The authors of the report counted more than 130 reported anti-Semitic incidents in Ukraine in 2017, they said. Also last year, more than 50 US Congress members condemned Ukrainian legislation that they said “glorifies Nazi collaborators” and therefore goes even further than Poland’s controversial laws limiting what can be said about local complicity during the Holocaust. A letter signed by the US lawmakers stated, “It’s particularly troubling that much of the Nazi glorification in Ukraine is government-supported.” It noted ceremonies, gestures and legislation venerating leaders of the UPA and OUN militias, who fought alongside Nazi Germany during World War II and whose troops participated in atrocities against Jews and other victims. Poroshenko’s government greatly encouraged glorification of those troops and leaders as fighters for Ukrainian freedom who it insisted sided with Germany only in order to fight against the Russian-controlled Soviet Union. Several cities across Ukraine named streets for the Nazi-collaborator Stepan Bandera, who prior to Poroshenko’s time in office was openly glorified only in the country’s west. Meanwhile, in the western city of Lviv, nationalists became emboldened enough to celebrate with city authorities’ permission the anniversary of the 14th Galician division of the Waffen SS. The anniversary events featured men parading in Nazi SS uniforms on the street. Such sights would have been unthinkable under Viktor Yanukovych, the corrupt president who was deposed in a 2013 revolution that ended with Poroshenko’s election. Careful to alienate neither ethnic Russians in Ukraine nor its powerful neighbor to the east, Yanukovych was less tolerant of this nationalist phenomenon. On this subject, Zelensky has said only that he personally does not favor the veneration of people like Bandera, whom he described as “a hero to some Ukrainians.” It was a markedly reserved formulation compared to the unreserved endorsement of figures like Bandera by officials under Poroshenko. The presidential campaign itself has featured some anti-Semitism. In some far-right circles, Zelensky’s work in a television stationed owned by the Jewish billionaire Igor Kolomoisky was proof of his belonging to a “Jewish cabal.” But it made Zelensky popular with other nationalists who appreciated Kolomoisky’s reputation as a fiery patriot. Such rhetoric is shocking to many of Ukraine’s 300,000-odd Jews, whose ancestors suffered murderous anti-Semitism in Ukraine for centuries before, during and decades after the Holocaust. The French-Jewish philosopher Bernard-Henri Lévy also referenced Ukrainian Jew’s bloody history in an interview with Zelensky, the 41-year-old son of scientists who lived near major Soviet army bases in Ukraine, that he published earlier this month in the Le Point weekly. “His Judaism. It’s extraordinary that the possible future president of the country of the Shoah by Bullets and Babi Yar is a self-affirmed Jew from a family of survivors from Kryvy Rih near Dnipro – the land of pogrom if ever there was one,” Levy wrote. “This postmodern kid, is he new proof that the virus of anti-Semitism has been contained” after the revolution, Levy added. 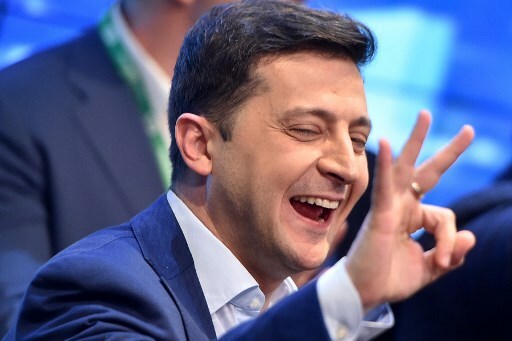 Zelensky, whose mother, Rima, is Jewish, has ingratiated himself with the Ukrainian public with such jokes as the star of “Servant of the People” – a primetime television show where he portrays a teacher thrust by an unlikely chain of events to become Ukraine’s president. He announced his candidacy in January, becoming an instant favorite. This popularity has allowed Zelensky to both win on an unusually vague platform and distinguish himself from his professional politician rivals, with their proclivity to hyperbole and nationalist slogans. For example, when a reporter asked him how he would deal with Russian President Vladimir Putin, Zelensky reverted to his comic roots, saying “I would speak to him at eye level.” It was a reference to him and Putin being at least three inches shorter than Poroshenko, a 6-footer. Zelensky opaqueness means a high level of uncertainty, Dolinsky, the Jewish community leader, said. Days after U.S. designates elite group a foreign terrorist organization, Ayatollah Ali Khamenei appoints Hossein Salami to replace Mohammad Ali Jafari as head of Revolutionary Guard Corps. Iran’s Supreme Leader Ayatollah Ali Khamenei has replaced the head of the influential Revolutionary Guard Corps, state TV reported on Sunday, days after the United States designated the elite group a foreign terrorist organization. The TV station did not give a reason for the change when it announced the appointment of Hossein Salami to the position and his promotion to the rank of major general. Salami, a 59-year-old who joined the Guard at the outbreak of the bloody 1980s Iran-Iraq war, later rose in the ranks to head its air forces. He served as deputy commander of the Guards for years and is known for issuing threats against Israel and the United States. “The Supreme Leader has appointed Salami as the new commander-in-chief of the Guards, who will replace Mohammad Ali Jafari,” it said. A statement from Khamenei’s office praised Jafari and said he picked Salami based on the outgoing commander’s advice. Jafari had held the post since September 2007. U.S. President Donald Trump on April 8 designated the Guards a terrorist organization, in an unprecedented step that drew Iranian condemnation and raised concerns about retaliatory attacks on U.S. forces. The designation took effect on April 15. Tehran retaliated by naming the U.S. Central Command as a terrorist organization and the U.S. government as a sponsor of terrorism. On April 13, Salami was quoted by Iran’s semiofficial Tasnim news agency as saying that he and the IRGC were proud of being designated a terrorist group by Washington. The IRGC, created by late Ayatollah Ruhollah Khomeini during Iran’s 1979 Islamic Revolution, is more than a military force. It is also an industrial empire with political clout and is loyal to the supreme leader. Comprising an estimated 125,000-strong military with army, navy and air units, the Guards also command the Basij, a religious volunteer paramilitary force, and control Iran’s missile programs. The Guards’ overseas Quds forces have fought Iran’s proxy wars in the region. The IRGC is in charge of Iran’s ballistic missile and nuclear programs. Tehran has warned that it has missiles with a range of up to 2,000 kilometers (1,200 miles), putting Israel and U.S. military bases in the region within reach. Salami, born in 1960, said in January that Iran’s strategy was to wipe “the Zionist regime” off the political map, Iran’s state TV reported. “We announce that if Israel takes any action to wage a war against us, it will definitely lead to its own elimination,” Salami said after an Israeli attack on Iranian targets in Syria in January, Iranian media reported. Israel, which Islamic Iran refuses to recognize, backed Trump’s move in May to quit a 2015 international deal on Iran’s nuclear program and welcomed Washington’s reimposition of sanctions on Tehran. In poll, Volodymyr Zelensky wins 73% of the vote; 25% of voters support incumbent Petro Poroshenko. Ukrainian comedian Volodymyr Zelensky has won the second round of a presidential election against incumbent Petro Poroshenko by a landslide, a national exit poll showed on Sunday. The poll said Zelensky had won 73% of the vote and that Poroshenko had won just 25% of the vote. Ukrainians voted on Sunday in a presidential runoff as the nation’s incumbent leader struggled to fend off a strong challenge by the comedian, who denounced corruption and played the role of president in a TV sitcom. Zelensky, who is of Jewish descent, has said that religion is a personal matter and plays no part in his campaign. If elected, he would become the country’s first Jewish president. Trump administration to end sanctions waivers for Japan, South Korea, Turkey, China and India when they expire May 2, according to three U.S. officials. Move aimed at further ramping up pressure on Iran by strangling revenue it gets from oil exports. Washington is poised to tell five nations, including allies Japan, South Korea and Turkey, that they will no longer be exempt from U.S. sanctions if they continue to import oil from Iran, officials said Sunday. U.S. Secretary of State Mike Pompeo plans to announce on Monday that the administration will not renew sanctions waivers for the five countries when they expire on May 2, three U.S. officials said. The others are China and India. The decision not to extend the waivers, which was first reported by The Washington Post, was finalized on Friday by U.S. President Donald Trump, according to the officials. They said it is intended to further ramp up pressure on Iran by strangling the revenue it gets from oil exports. Since November, three of the eight – Italy, Greece and Taiwan – have stopped importing oil from Iran. The other five, however, have not, and have lobbied for their waivers to be extended. According to a report on the Qatari website Alkhaleej Online, a member of Fatah’s central committee revealed on April 20 that heavy Arab pressure was being applied to the Palestinian Authority leadership with regard to U.S. President Donald Trump’s Mideast peace plan – the so-called “deal of the century” – that the White House is expected to unveil in June. According to the report, the official stated that Saudi Arabia was leading the campaign. The source added that the position of the Arab countries on the deal cast a disappointing light on all their previous support for the Palestinian cause. He emphasized that the PA leadership would never give in to pressure, whether from the Arab states, the United States or Israel. It should be noted that the Alkhaleej Online, which is under Qatari ownership, is hostile to Saudi Arabia in light of the tensions between Doha and Riyadh. This interview will change your mind about the MSMs narrative regarding these individuals. They are both VERY intelligent and thoughtful.